Check out my first Gilt.com review HERE. Measurements: Body length 5¾", height 4", width 1¼"
Unless otherwise stated, this is a brand new wallet, and there was also a slash in the price. Gilt was selling it for $329. I was also browsing Gilt a lot because I've been getting emails giving me 30% off a purchase (maximum discount $75). So I got the maximum discount and ordered it for $261.95 (shipping was $7.95). I used Ebates and got 2% cash back, and my Bank of America Travel Rewards credit card gives 1.5% cash back, so after that, my purse comes out to a final price of $252.78. 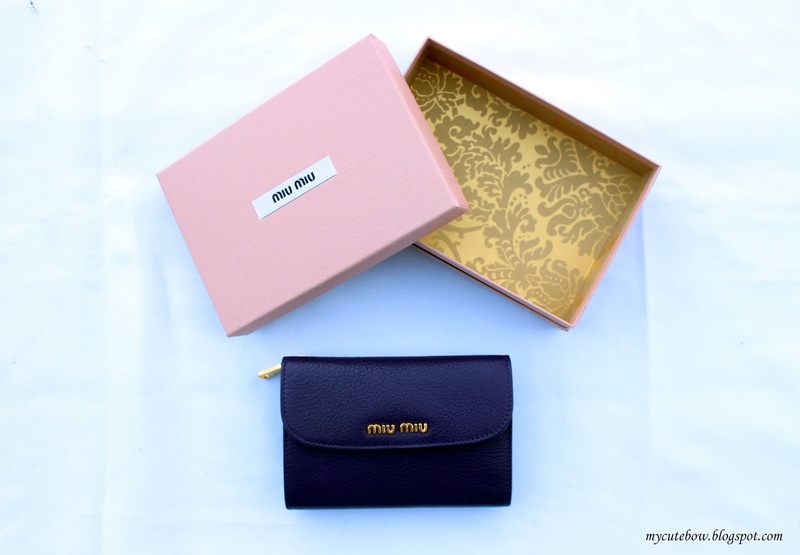 Which I think is a great deal since this wallet retails for $450. That's 44% off! I feel like my designer purchases have all been worthwhile. I don't spend on full retail prices, and I invest in new/like-new/vintage items that only increase in value. So in the end, I don't lose money from it and get to enjoy the perks of a great piece. It came in its original box with bar codes and details. 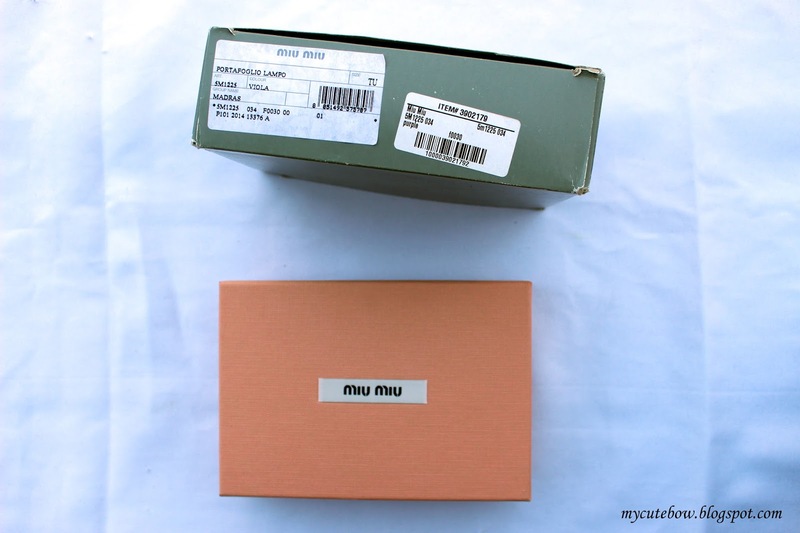 And a very pretty pink Miu Miu box with gold lining. 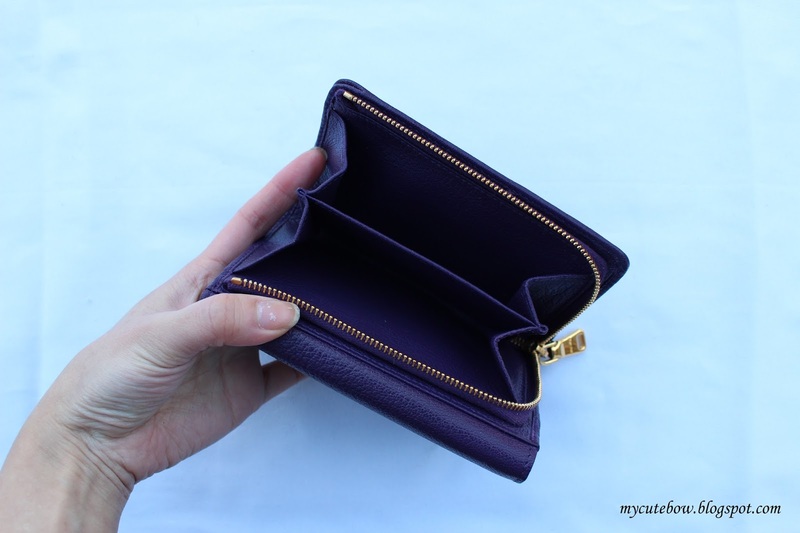 I chose the purple color since it's a wallet and I didn't want to go with the default black. 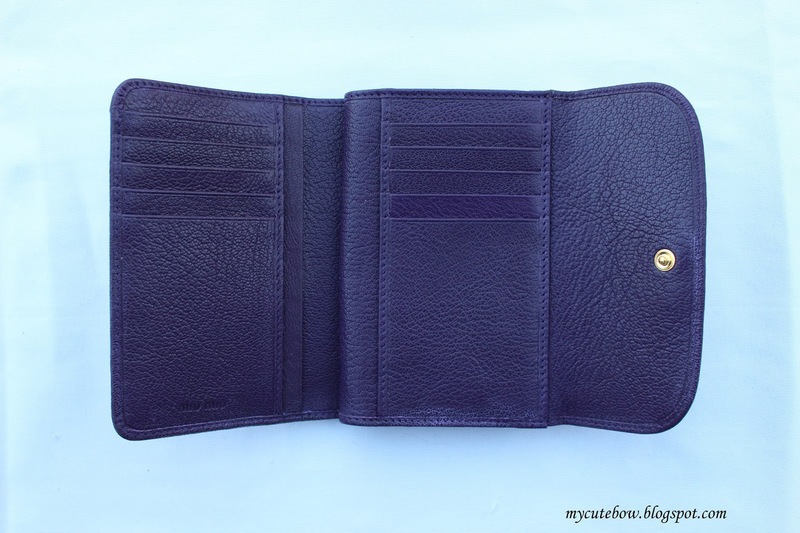 The inside has 10 credit card slots, 1 bills slot at the top, and 3 sleeves where you can slip things in. I like that this wallet also has a zippered side where you can put coins in. This wallet is very roomy but still compact. 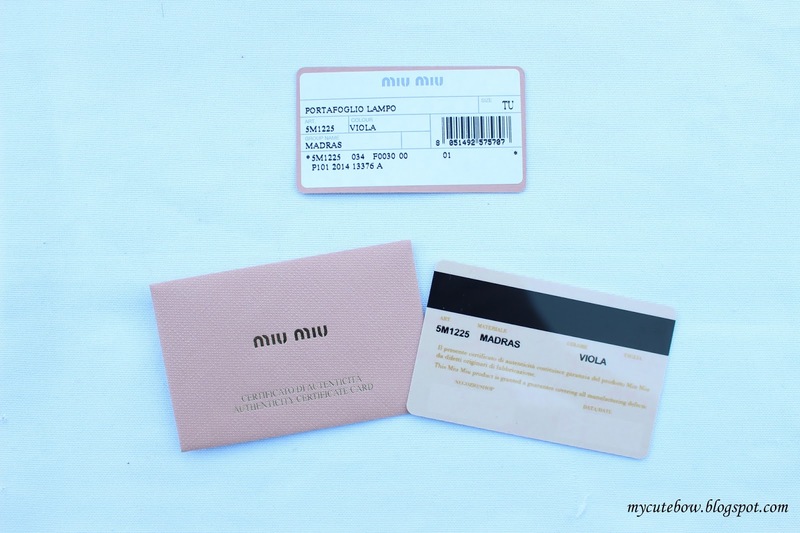 It also came with the authentication card. Which definitely gives you reassurance that you got an authentic item and is useful to retain if you ever want to sell you it. Overall, this was a positive experience. I have no complaints this time. It also arrived really fast. I ordered on 2/20 and it arrived on 2/25. 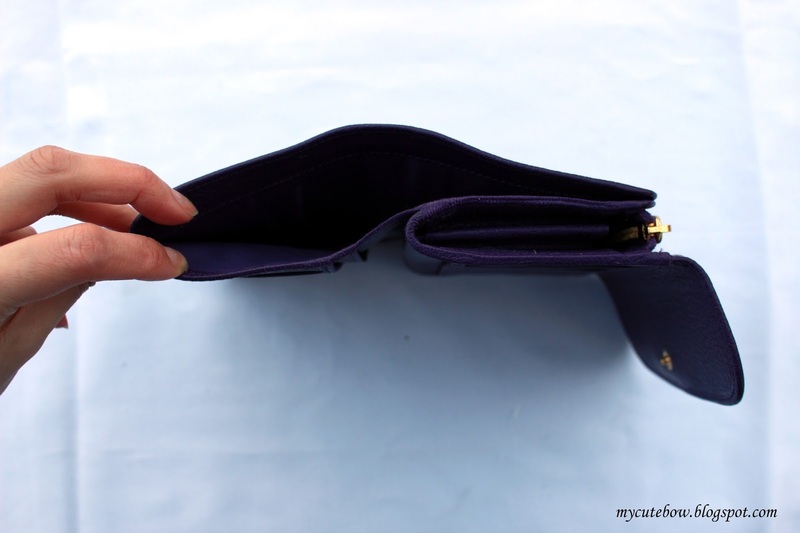 9/7/15 Update: After using the wallet a few times, I notice the leather on one of the folded edges is peeling. This is upsetting when I thought this would be a high quality wallet. But I should have expected it since it is a very soft and delicate leather, unlike saffiano leather which is more durable. I now keep it in a pouch so that it is safe from rubbing against anything inside my purse.